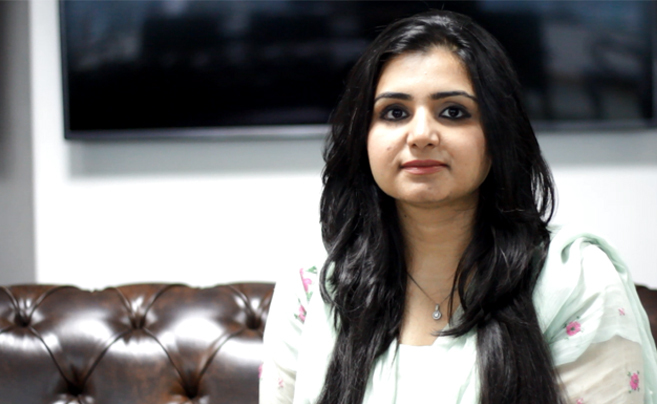 Komal Farooq, the lead facilitator of the Designing Innovative Learning Applications Workshop talks about what motivated her to abandon her dreams of becoming a banker and enter the field of Innovative Technologies in Education. A: I’m from Lahore and I have a BBA Finance degree from the Lahore School of Economics. I’m currently doing an MS degree in Innovative Technologies in Education (ITE) from NUST. A: After completing my BBA, I had wanted to enter the field of banking but took up a teaching job at Beaconhouse Newlands temporarily. This experience really changed everything for me; I taught there for 3 years and realized that the sense of achievement and satisfaction one gets from teaching is unparalleled. I took up the MS ITE program because I realized the need to study pedagogical techniques to devise better teaching solutions, and the idea of combining IT with education is really exciting and promises to overcome many barriers in teaching and learning. When I was working as a teacher, I had a student in my class who lagged behind the others; he was a slow-learner and suffered because as his basic concepts were not clear. Additionally, he also grappled with a significant language barrier. When I tried to pay individual attention to him, the rest of the class suffered so I decided to let him be and concentrate on the rest of the class. However, when I was checking my class’s mid-term examinations, I realized that everyone had achieved straight A’s in the four subjects I taught, except for that student, who had failed them all. I was really jolted by this and it made me realize that we need to modify educational techniques to accommodate the varied needs of different students. Share the post "“Education Techniques Must be Modified to Cater to the Needs of Different Students”- Komal Farooq, DILA Workshop Facilitator"